Thanks to homemade-preschool for the banner design work. Why should anyone have an interest in "Road-Peace?" You want to work with, and for, "Road-Peace." Imagine that World Peace has been established. Would those who were kind and wise enough to accomplish this feat even think of treating each other the way we do in traffic? Why don't we begin to treat each other the way that those wise future folks will? (poignant pause) Let us begin to improve our behavior in traffic, challenging ourselves to exercise kindness, patience, forgiveness, thoughtfulness and love for our fellow humans. Whether we cycle, drive or walk, we can "think globally" (World Peace), as we "act locally" (with concern for the safety of each and every one of us). As our behavior in traffic improves, our new habits will come to be practiced in other areas of our lives, as well. on the road to World Peace." we will be safer on the road. and with a more positive attitude. to the remaining barriers to peace. a step on the road to World Peace. 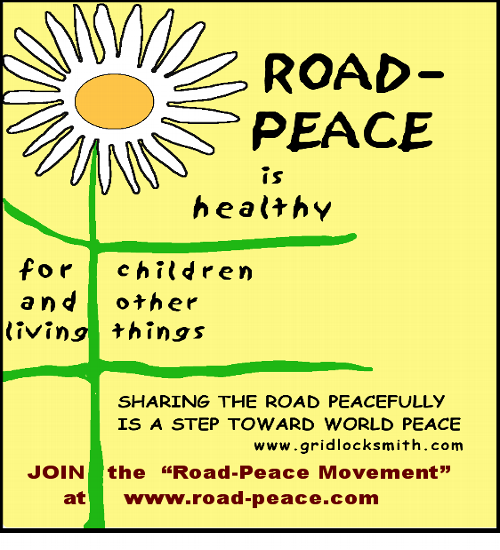 Help fund the "road-peace movement." Will you be a sport? Are you willing to share your talents? to website building and legal issues. if one guy does all the work, is it? with subject: "I want 2 help"
as part of your ad design. "Want to help spread the message? Customized versions of some of these items may become rewards for financial supporters at kickstarter.com. You may wish to subscribe to the weekly newsletter, in which they share their favorite projects. Hopefully, this one will be featured, soon. If you can figure out how to lay two of these, side-by-side on 8-1/2x11, they can be cut apart for posting on bulletin boards. Or, 4 to a sheet, or full size for store windows. Less youthful visitors will recall "Mr T" of the TV series, The A-Team, who frequently intoned, "I pity the fool!" 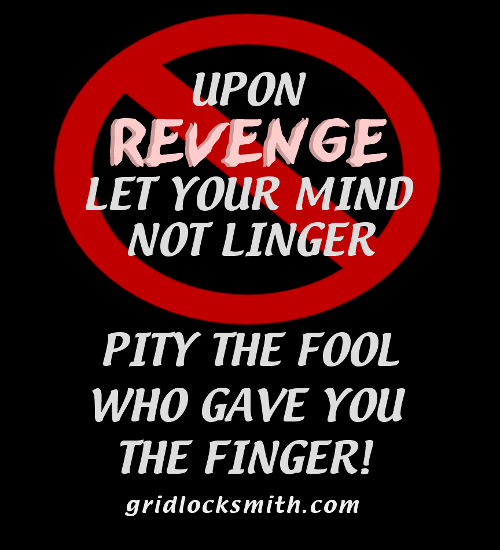 This poster, which attempts to remind us with humor, that the power of forgiveness neutralizes the urge to rage, can also be found in the gridlocksmith store. Comments? Suggestions? Want to help? 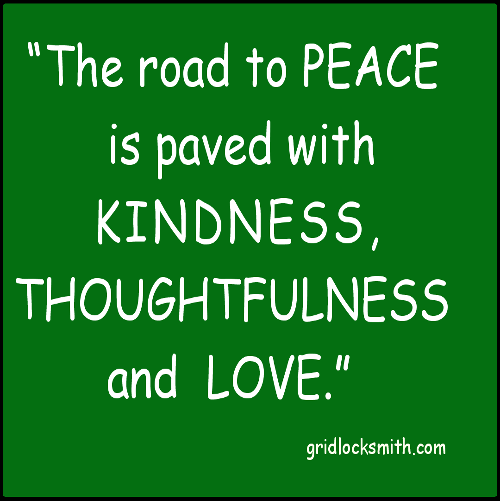 Learn more about being a "road-peacemaker,"
Be kind and thoughtful, out there.